Every once in a while, when I post a printable, I get a request for something special. I am always happy to oblige if I can make it work. 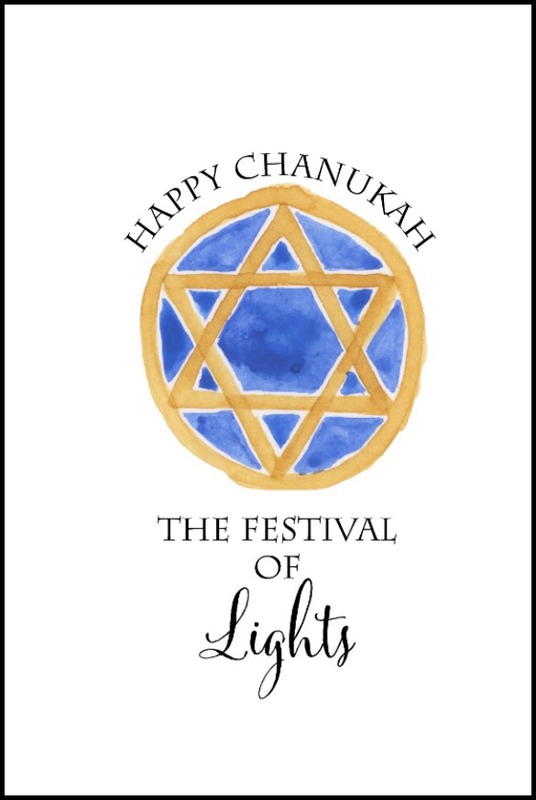 When one of my Facebook followers asked me to make a Happy Chanukah printable, I have to admit I was a little nervous. I knew about the Jewish holidays but as a Catholic, I had no knowledge of what they meant or the symbolism. So I did some googling and a search on Etsy for some graphics. This is what I came up with. I must have checked the spellings no less than 100 times before I was ready to publish these printables. I’m told a few different ways are acceptable and it’s really not the English spelling that’s important but rather the Hebrew spelling. I hope that if you are of the Jewish faith, they do justice to your long and rich history. Even though they were a bit out of my comfort zone, I enjoyed making them very much. Molly from Digital Press Creations is a gifted watercolor artist. Visit her Etsy shop to see more. Want to pin or share this post? Just use these easy sharing buttons! These are absolutely delightful. Thank you for taking a chance and creating some beautiful artwork to celebrate Hanukkah! I subscribe to a number of blogs and have been inundated this week with Christmas decorating tips and photos. It was so thoughtful and kind of you to take a risk, go beyond your comfort zone, and produce something so pretty and so right for those of us who celebrate Hanukkah. Thank you. Oh thank you Debra for telling me this. I honestly wasn’t sure but now I’m happy I did it. Blessings to you and Happy Hanukkah! Thank you for the absolutely LOVELY printable! Ann, they are perfect! Being of the Jewish faith, I thank you for making them! 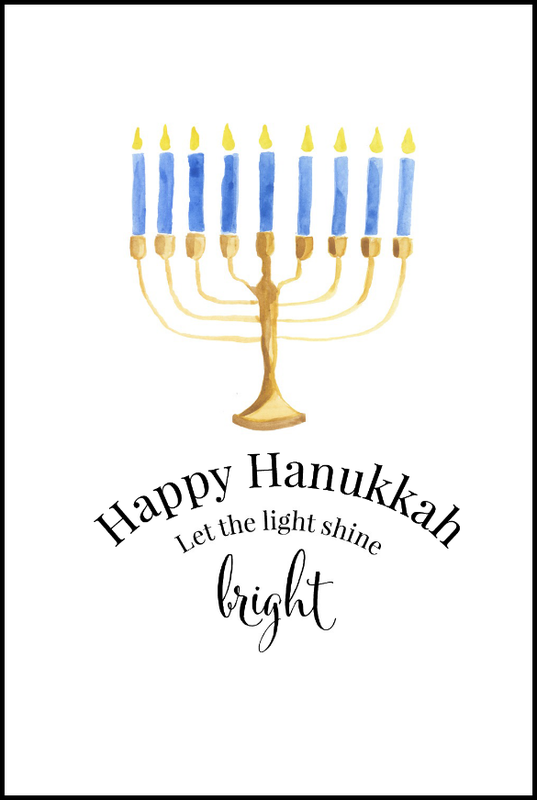 And don’t worry about the spelling (which you did get right by the way)…there are so many ways to spell Chanukah that it’s nearly impossible to get it wrong – anything that’s close is probably another variation, LOL! Thank you Amy! I was so worried that I would get it wrong…I appreciate that you took the time to let me know I did OK! I LOVE your beautiful printables! I also love the font you used for the words “Lights” and “bright.” Can you please tell me the name of the font you used? I’d appreciate it very much. Many thanks! Unfortunately it’s not free but it’s a lovely font. So kind of you to reply! Thanks again–and happy holidays! LOVE the Chanukah printables and they are PERFECT!! I will pass them on to a teacher friend for her Hanukkah celebration. You inspire me morning after morning! Were I still teaching I would use these printables in some sort of project with my students. Thank you, Anne, for email frendship and holiday delights! Thank you. You did a great job. I really appreciate your effort.